Now long gone from loads of places, trams once were one of the world’s most popular forms of urban transport. We are lucky enough to have trams in our city and use them regularly. 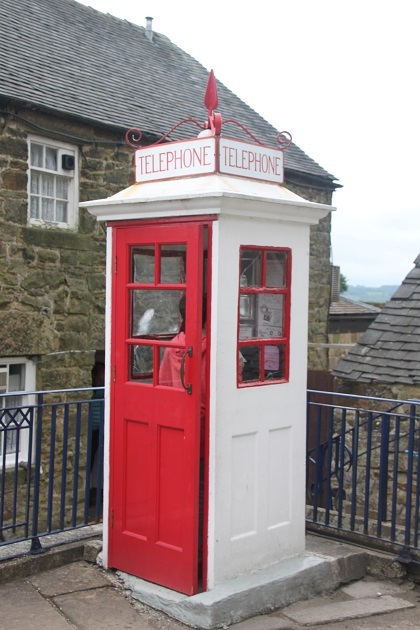 They are sleek, modern and a great way to travel but are nothing like the beauties we saw at Crich in Derbyshire. We spent the most wonderful day at this lovely museum where they have Britain’s only large collection of old trams. Deep in the Derbyshire hills this place is in an old and disusued quarry. It is run by some of the most enthusiastic volunteers you’re ever likely to meet. Not exactly a cheap day out – it cost £14 each for Husband and me and £8 for Son, but the ticket lasts a year and you can return unlimited times. We arrived to a full car park and a couple of coaches. Cue sinking heart, however once inside the whole place did not feel even remotely crowded. We paid our entrance fee and were given an old penny each to use as the fare for the tram. They had three old trams running all day. You can ride unlimited times on these vintage beauties as they travel up and down the cobbled streets of a little recreated period village. They aim to have the right sort of tram for the weather too – no worries about getting wet in the open air models. 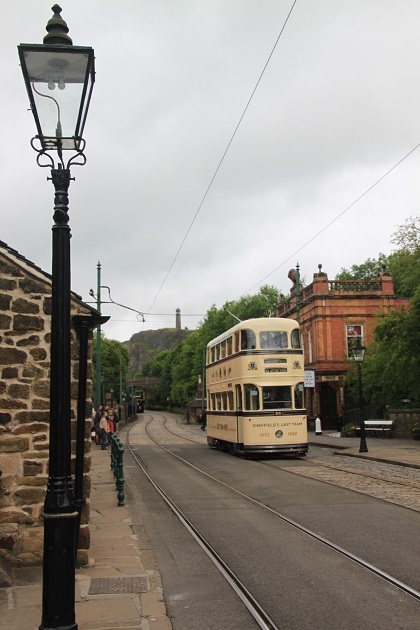 The street scene is just the perfect backdrop to showcase this wonderful historic tram collection. We rode all three trams a couple of times. One was a single decker and two were double deckers – tall and gaunt. A bumpy ride at times but those beautiful wooden interiors make up for anything. 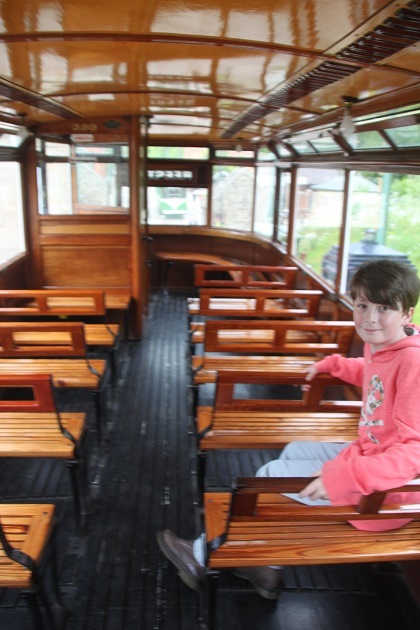 Son’s favourite was the former horse drawn tram with a little brass railed staircase curling to the top deck. He was also intrigued that when we got to the end of the line the driver walked through, shifted the seat backs and everyone turned to face the other way. In the heart of the village is Tramway Street. 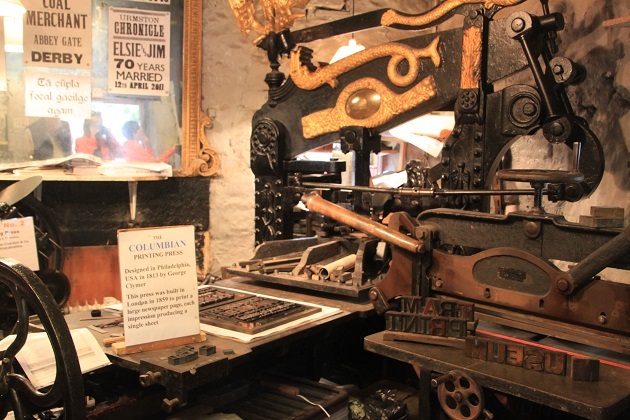 We peeked in at the Eagle Press with all its print equipment but Son couldn’t wait to get inside the old fashioned sweet shop. 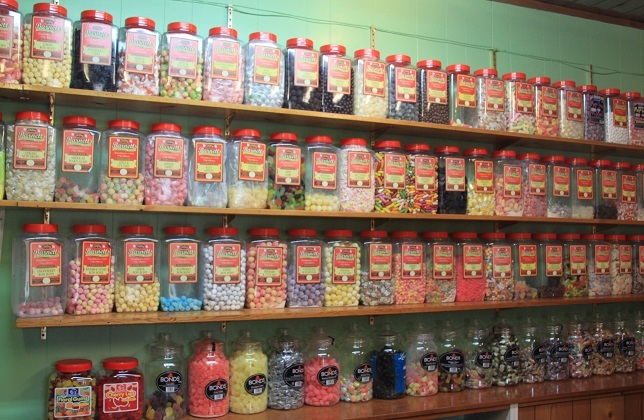 Rows and rows of loose sweets – what a choice. He came away with a paper bag stuffed full of treats. Most of the buildings along the street have been rescued from towns and cities around the UK. A trip to the ice cream parlour then we headed indoors. 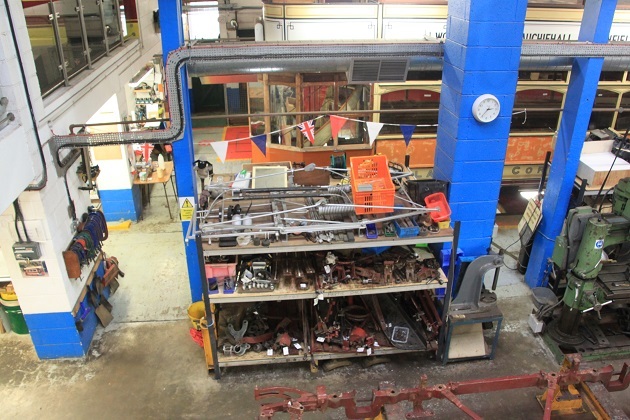 There is a little museum with various exhibitions and a chance to look down on trams being restored in the Workshop Viewing Gallery. 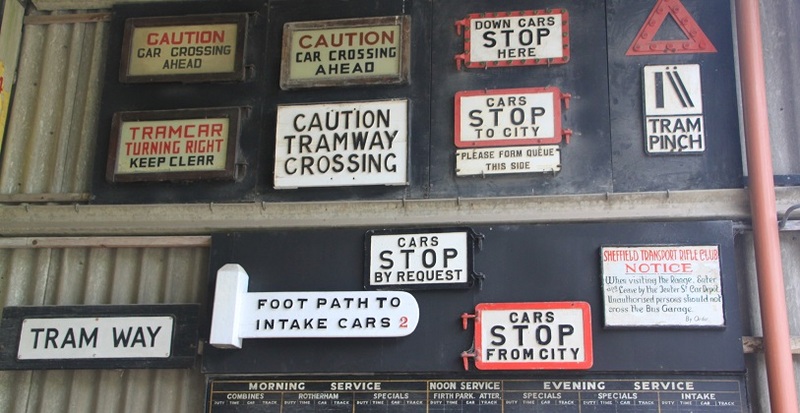 We found a massive collection of old trams in the depot. 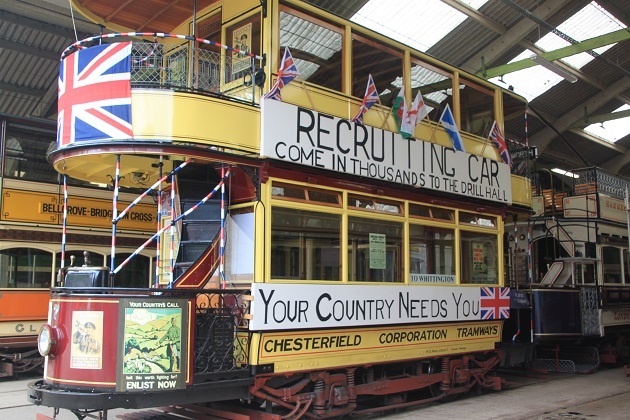 You can see them up close and read more about them, my favourite was most definitely the World War 1 recruitment tram, decorated to promote enlistment in the army in the war. Drinks and a snack in the old fashioned pub were most welcome before we began our afternoon exploring. 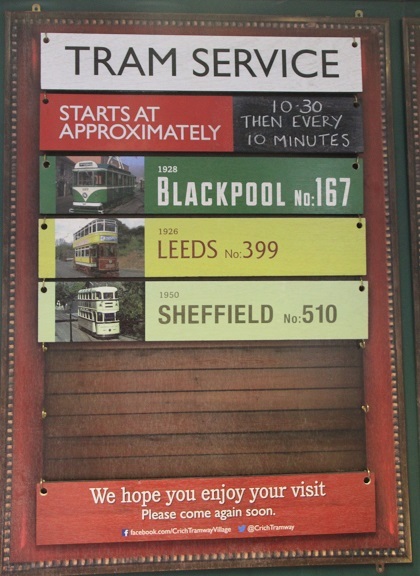 An interesting place to visit, I’d definitely like to visit some time as I’m very fond of trams. When I was at primary school one year my parents organised an early birthday party for me on an illuminated Blackpool tram – it was the Rocket. I still have the photos! That sounds like an amazing birthday party!! We love the Blackpool trams during the Illuminations, what a treat! This museum is great, even if you’re not into trams there is so much to see and do. This looks like such a lovely day out and the vintage trams look much nicer than their present-day counterparts! Flipping the seats to face the other way was something I noticed on the trains in Japan, quite a practical idea since a lot of people don’t like facing “the wrong way”. Old-fashioned sweet shops are a favourite of mine too, sherbet lemons and sherbet pips are something I miss when I’m not in the UK! Love sherbet pips too – can’t get enough of those!! This was a great day out, those old trams are stunning. We travel around our city by tram a lot and it’s such a great way to get about, this was so special though – they don’t make trams like this anymore! I do like a tram but the sweetie shop wins! With a choice like that it couldn’t not! What fun! That’s a great find. It really was a great day out in a lovely place. We had such a great day out Rosemary, we have a great tram network in Manchester but this was something extra special. Needless to say the sweet shop was a huge hit with our son! We’re on our second week of half term (flying past too quickly) and have been enjoying some fantastic sunshine and lovely days out. Normally we go away this time of year, but it’s been nice to recharge the batteries at home! Just had my dad for a week as well, he’s gone home and my sister is coming next weekend too so we’re looking forward to that. Hope your week is going well too. It’s such a fun and interesting museum and the chance to ride those lovely old trams is fantastic. Those are beautiful trams! 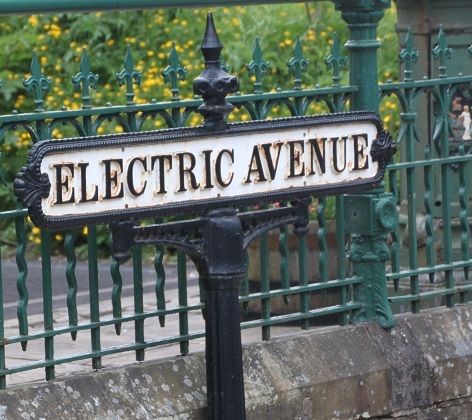 I liked reading the tram stop signs, and seeing the village. Thanks for the arm-chair tour! It’s such a great little place to visit. Their collection of trams is just amazing and then to ride them in the village recreation just adds to the atmosphere. We loved it. 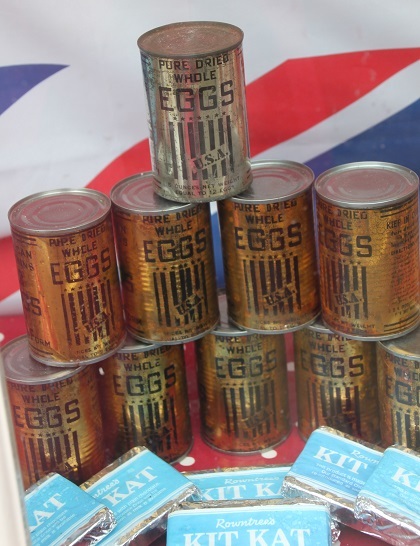 I went to the Isle of Man on holidays with my family as a child – great memories. It’s a place we’ve long planned to revisit with our son, just never managed to do that yet but the idea of all those steam railways definitely appeals! Let me know if you manage to get here, we could try and help with arrangements / suggestions. I’ve seen pictures about the pub tram (probably on your blog!) it sounds like a really great thing to try out! 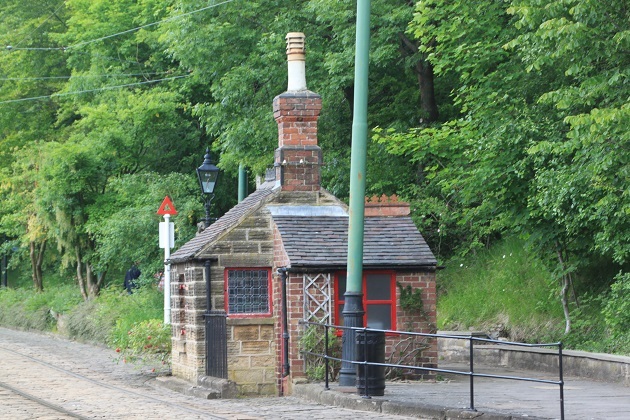 I was a student in Sheffield and remember visiting Crich, but it wasn’t anything like as developed as this. 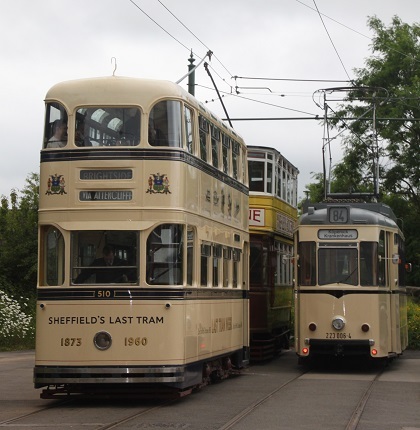 Spotted the old Sheffield tram – well before my time, but the livery was still the same. And of course, Sheffield has trams again now. 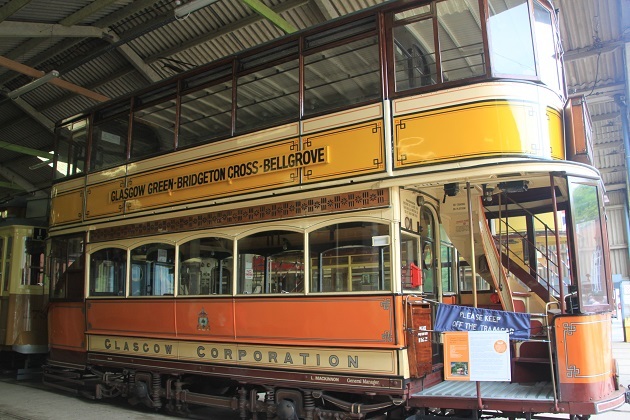 Also spotted the Glasgow tram for Bridgeton Cross which is where I now spend a lot of time at the Women’s Library. It’s a great place, I assume they add to it as much as they can. We loved spotting the old trams from cities and places we’d visited. This looks to be a fantastic day out! My boys would absolutely love getting to travel around on the trams to their hearts’ content and we all love an outdoor museum. It was superb – the fact everyone working there seemed to be a volunteer as well made it a lovely place to visit. The trams were loads of fun to ride and there was so much more besides. It was a great family day out. Volunteers are often more knowledgeable and passionate about their subject than paid docents and guides. Absolutely – the love and passion shines through! I love this place and living only 15 miles away makes the annual ticket really good value for money! You go to such cool places, Joy. Love those trams, I wish we had them here. I know Cape Town had trams, a long time ago, but they were discontinued before I was born. The village scene looks delightful! It was wonderful Reggie, the old trams were gorgeous and they had them from all over the world. The village is just the icing on the cake, such a lovely day out! 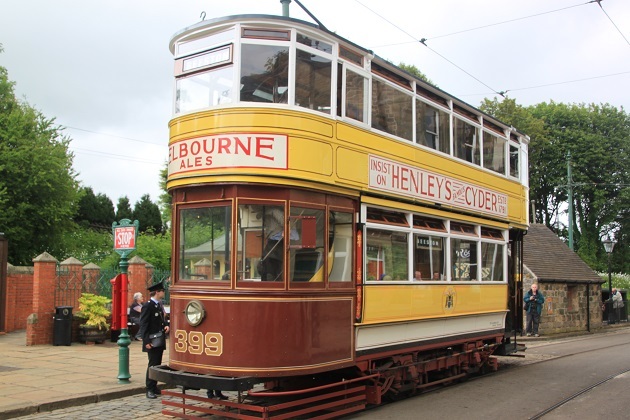 Joy, a day with these beautiful old trams and then a sweet shop thrown in for good measure…sounds like the perfect day! It was Pam, those old fashioned sweets were wonderful and the old trams, although not as comfortable as our modern ones were just gorgeous. What a fun place to visit! Great pictures too, as always. Thank you! It was a great day out, riding those old trams was a lovely experience. I love these kinds of places. Missed this one so have to make sure it seen next time I visit. It’s a wonderful museum Terry, all volunteers who run it as well, makes it extra special. This looks like so much fun – like going back in time. I love trams too – what’s not to love! 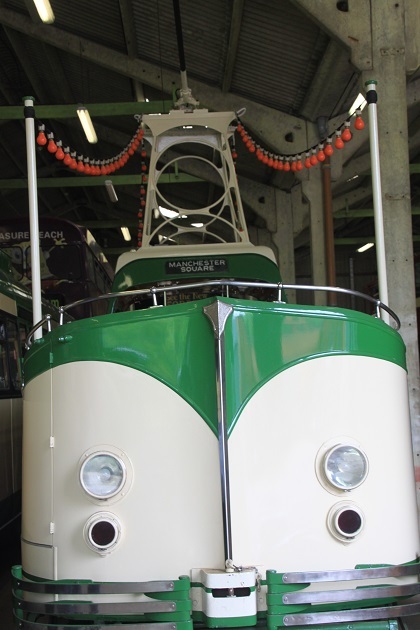 These trams were so beautiful inside and out – a bit different to the modern, sleek trams we have in our city!! 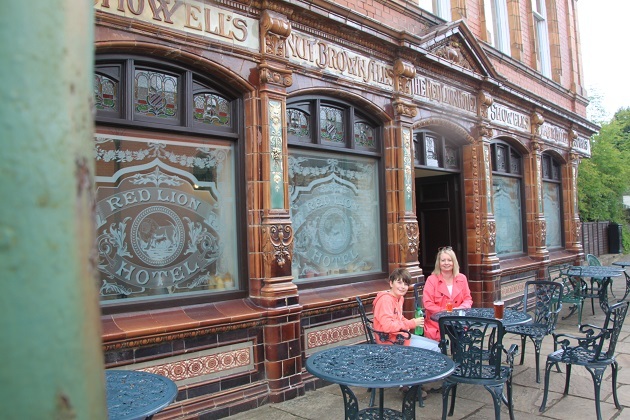 It was a great day out and the old fashioned sweet shop – well what can I say!! OMG this is awesome! I can’t believe my friend didnt take me here last year when we visited her! She lived in Derby! You’ll have to come back sometime!! It is a gorgeous place, definitely worth a visit.